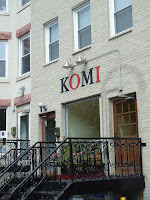 Tom Sietsema's fall dining guide in The Washington Post just went live online, and the biggest news is that Komi is elevated to four star glory, while Citronelle was docked a star for what Sietsema calls "one of the sorriest service experiences I can recall." Ouch. My favorite Chinese take-out joint gets a whopping two stars, but that's not the only "fast food" on the list. Nando's Peri-Peri, Ray's Hell-Burger and Tackle Box all get two-star shout outs. Wow - thanks for the link because I can't find the guide on wapo.com! Mmm, Great Wall spicy tofu. I was pleased with a lot of the choices. Psyched to see 2941 go up in estimation, as I'm supposed to go there for my engagement celebration. And thrilled to see some new selections I haven't tried in Falls Church. Yay for Cork, Mio, Komi!